When it comes to getting the most out of SEO, keyword analysis counts for a lot. More than just finding potential keywords, you need to see how successful – or unsuccessful – your choice of targeted queries is. In SEO, these are generally labelled as ‘winners’ and ‘losers’ based on the Search Engine Results Page (SERP) positions that have been lost or won. This is vital for any ongoing success. If a certain term is losing, perhaps it’s time to take more action, or simply apply focus elsewhere entirely. 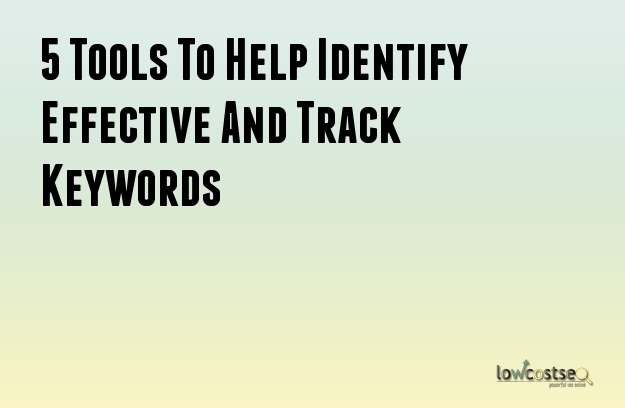 If you’re not sure how to track this important information, here are 5 great tools to identify and track effective keywords. Search Metrics is one of the most in-depth services available, at least when it comes to getting reliable SEO data back. When it comes to keywords, this tool actively tracks organic search terms and showcases the winners and losers in a clear manner. Furthermore, Search Metrics is always useful thanks to its wider suite of tools. It can also be used to highlight what domains are winning and losing in a similar manner. In this way, you can look at both keywords and the wider website, giving you the macro and micro views. Of course, this can also be used to track the competition as well. SEMrush is very similar to Search Metrics, in that it allows for a clear look at what keywords are successful or not, highlighting which ones are pulling in the most traffic. In addition to this, SEMrush is a great tool for analysing competitors, including ad copy and other alternative SEO targets, such as PPC. As such, it’s often quite useful in giving you a broad view – always handy when your wider strategy involves a variety of methods and traffic sources. Developed by Screaming Frog, SEO Spider Tool is a free program offering a range of analytical services. While many of these focus on how your website is crawled and viewed by Google, it does also help identify broken links. As such, SEO Spider can’t necessarily identify winners and losers but, if you use it in conjunction with one of the other tools on this list, it’s quite useful. Found a winning keyword is suddenly losing? Maybe it’s a new Google Panda update, or maybe you’ve lost a few links. SEO Spider has a powerful broken link checker – even in the free version – among its other great features and can help find these faults. In short, Authority Labs is very similar to Search Metrics, in that it offers comprehensive data regarding your keywords, as well as those of your competitors. What sets it apart, however, is the ability to break the data down. Authority Labs offers local search data, as well as information across the likes of Google, Yahoo and Bing. This way, you don’t just find the winning and losing keywords, you actively see how each particular term is ranking. Perhaps one comes up more in certain countries, for instance, while another does well on specific search engines. All of this is relevant and, if used correctly, could greatly help your SEO campaign. This tool does exactly what it says and, while it might be very simple, it is also free, which is a very relevant factor for many people. Broken Link Check gives you comprehensive lists of broken links, helping you find quick fixes to improve your SERP position. Similar to SEO Spider, this is best used alongside more detailed, analytical tools and services. When it comes to being visible, the right keyword means everything. This has been true since before SEO even existed. It’s the reason plumbers want to be listed as “plumbers” and not “water mechanic” for instance. It’s an old argument, but it’s a vital backbone to SEO thinking – people search for exactly what they need, so you want these terms related to your website and business. This is highly important when dealing with PPC services, as Google Adwords campaigns are built around the relevant search terms. On the other hand, the right keywords are a crucial cog in any SEO engine, too. So, with this in mind, how do you find the right keywords for your website? Looking in Google Keyword Planner, or other keyword tools, it’s quite clear that short, simple keywords are a high priority. We previously spoke about the power of simple information (or KISS – Keep It Simple, Stupid) and a similar argument applies to many keywords, especially commercial products and services. As another example, people wanting to find a builder online will often look for “builder”, rather than “construction worker”. The latter might be used for more technical searches and via industry specialists, but it’s not what the typical person might search for. Of course, the problem with using the short, powerful keywords is that plenty of other websites are, too. This means the competition is particularly high. This would create a higher auction cost for PPC, and a greater SEO effort to push up the search results. However, what you can do to off-set this is to utilise the long tail keywords. Long tail refers to the less popular keywords. Although a singular term here doesn’t have the search numbers as one of the leading keywords, the amount of searches available is still quite large. Specifically, these are often more detailed, so you can use more complex terminology. Using the builder example above, this is where “construction worker” can be a great second keyword and so can more specific terms “property builder” “home builder” and other similar ideas would all fit here. Finally, as an extra example of long tail keywords, you can use your location target relevant customers. Unless you can deliver across the country, it’s best to target your local area. If you have multiple areas, then multiple location SEO strategies can be implemented, too. A restaurant in London, for instance, needs to state it is in London, as this is something people will specifically search for. While this is targeting the long tail keyword, which is a less popular search term, the people actively searching are much more relevant to you. In fact, they’re the exact business you want. Whether its PPC or part of a wider SEO package, we understand the need for the right keywords. A good strategy will offer a combination of short, simple keywords and long tail variants, to help target the right users and improve your website’s visibility.